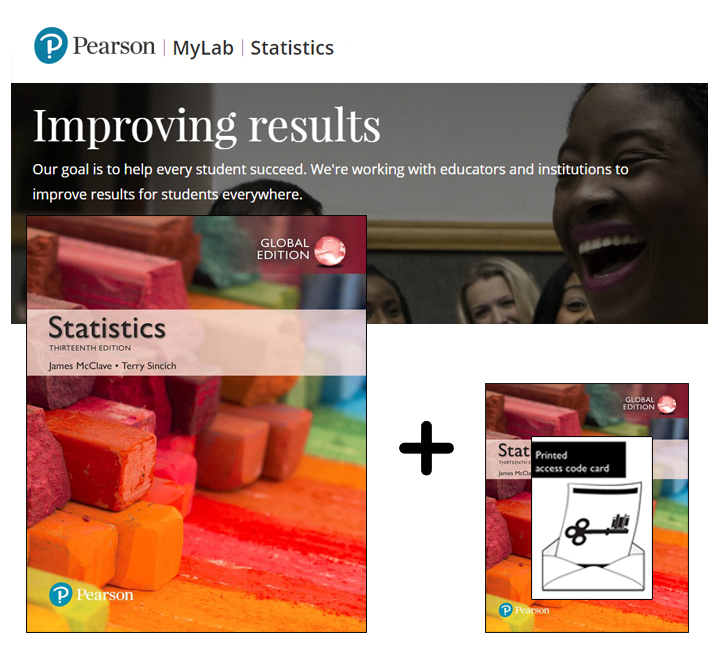 Author(s) McClave, James, T.; Sincich, Terry, T.
This pack contains 1 copy of Statistics Global Edition + 1 printed access card to MyLab Statistics with eText. Classic, yet contemporary; theoretical, yet applied—McClave & Sincich’s Statistics gives you the best of both worlds. This text offers a trusted, comprehensive introduction to statistics that emphasizes inference and integrates real data throughout. The authors stress the development of statistical thinking, the assessment of credibility, and value of the inferences made from data. This new edition is extensively revised with an eye on clearer, more concise language throughout the text and in the exercises. Ideal for one- or two-semester courses in introductory statistics, this text assumes a mathematical background of basic algebra. Flexibility is built in for instructors who teach a more advanced course, with optional footnotes about calculus and the underlying theory. MyLab Statistics is an online homework, tutorial, and assessment product designed to personalize learning and improve results. With a wide range of interactive, engaging, and assignable activities, students are encouraged to actively learn and retain tough course concepts.